The 24 pack offers a convenient gravity feed display. If you dont want to use the gravity feed just open the top of the box to remove the packets. Each box contains 24 individual packets that are for single use. For best results: Simply toss 1-3 Colorful Fire packets onto a high point of any indoor/outdoor wood burning fire. DO NOT open the packet! Size and intensity of the fire will determine the number of packets needed and the time the colors are visible. 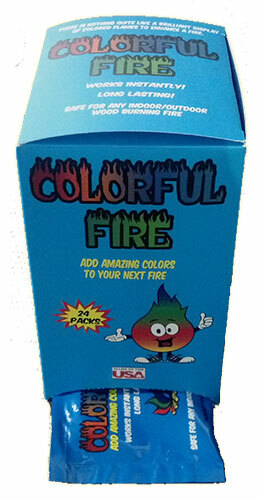 For most fires 1 packet is enough for 30-60 minutes of color.